CRETE SENESI: A LUNAR LANDSCAPE! In the immediate vicinity of Siena, along the hills that surround the city from the south-east, opens up a territory, one of the most striking: the Crete Senesi. Here you can find a landscape characterized by a succession of gray hills, alternating rugged areas where nature has shaped in the wild territory. The water, in fact, running out of control along the hills slopes dug deep furrows on which vegetation cannot take root. These ravines and deep grayish tens of meters, known by the name of “calanchi”, often stretch for hundreds of meters from the ridge to get to the valley floor. 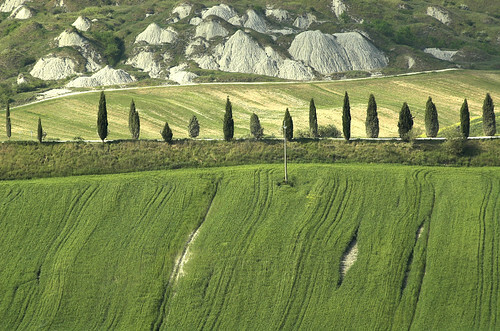 Another erosive form present in the Crete Senesi are the “biancane”. These reliefs that appear like white domes are due to forms of water erosion of clays, from which white sodium sulphate exudes and is deposited on the surface. In limited areas you can see also the “frills” (balze in italian), which are points where the hilly terrain is interrupted. It is also worth noting that this area was completely submerged by the sea 2.5 million years ago. Here you can find lots of villages as Asciano, Buonconvento, Monteroni d’Arbia, Rapolano Terme, Trequanda and San Giovanni d’Asso. A feature of the area is the presence of many Spa known for the beneficial properties of its waters. Among the most popular we suggest visit the Terme di San Giovanni Rapolano and Terme Antica Querciolaia Spa, both in Rapolano Terme where you can enjoy indoor and outdoor pools and also some beauty treatments! The Crete Senesi are therefore a place where you can enjoy a little ‘well-deserved relax and unwind from everyday stress! Any person crossing the territory of the Crete Senesi immediately realizes what this is really rich: clay. This has encouraged the production of this material, originally “poor”, to turn it into something of greater value. This stemmed from the art of baking clay to produce “cooked”. To understand the importance that has baked in this area should visit two architectural masterpieces: the Abbey of Monte Oliveto Maggiore and the old town of Buonconvento. The first one founded in 1313 by John Tolomei, is constructed almost entirely in brick. You can access to the abbey from the fortified palace erected in 1393 to defend the monastery. The interior of the abbey, divided into three cloisters, preserves important works of 400 and 500 and a magnificent library containing over 40,000 ancient books. As the abbey also near the center of Buonconvento, still enclosed by its walls, has most of its medieval buildings constructed in brick. Remember also the presence of the Via Francigena, the long pilgrimage route that linked Europe to Rome. The main center of Crete Senesi is however represented by the village of Asciano, which is about 30 km far from Siena and where you can go through Monteroni d’Arbia along a scenic road made of curves and hills, perfect for lovers of bike and photography. Here you can watch and contemplate a beautiful landscae in the silence of nature and the woods surrounding it. In Asciano, which has been the granary of Siena, you can see farms, isolated buildings in the countryside, where in the past families lived. The farmers have cared for centuries the balance and beauty of the landscape based on the main crops such as wheat, vines and olive trees. In the ’60s, with the end of sharecropping begins the abandonment of the countryside partly offset by real immigration of Sardinian shepherds who import in Tuscany the culture of cheese. The Crete Senesi are an inevitable stop for lovers of cycling and mountain biking. Cycling in this area is certainly a fascinating experience for those that prefer frequent changes and trajectories. Among the main roads we can mention two in particular: the path of Monte Sante Marie (Asciano– Torre a Castello) and the way of Pieve a Salti (Buonconvento – San Giovanni d’Asso), where you can go by bike or by walk. For lovers of road bike we suggest you Lauretana road from Siena to Asciano and arrives till Chiusure, Monte Oliveto Maggiore and Buonconvento. At this point we can only wish you good visit to discover one of the most beautiful areas of Tuscany! Hotel Borgo Grondaie is the ideal location for visiting the town and surroundings area of Tuscany. Moreover the road leading to The Crete, the SP 438, is within a easy drive from the site.